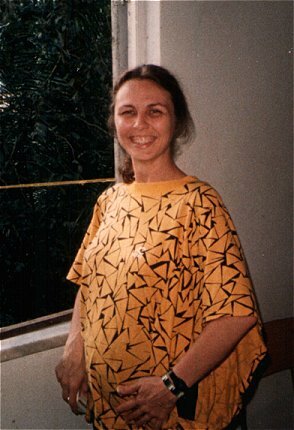 Happily pregnant, at 6 months, I had no idea that it was my ‘bump’ that would get me over the ‘hump’ and make me an official resident alien in Brazil. Carnival came and went, and then I was told that I should wait until a “friendly” federal policeman returned from holiday. I waited a few more weeks, and there was no sign of him. Finally I decided to fling myself on the mercy of the immigration office, which was run by the fearsome Federal Police (note that this was shortly after the end of the dictatorship, when they had had a hand in torture and “disappearing” people, and that mentality still lingered), and found no sympathy at all. I was fingerprinted for the first time in my life – with black ink – fined and given a few days to leave the country. Fortunately, a friend lent me the money for a plane ticket, for there were no buses available at such short notice. I paid the fine and headed for Paraguay to renew my visa. In those days, that was possible. If it had happened nowadays, I would have had to return to my home country. That gave me another three months, renewable in Brazil for another three, after which I would once again have to go to Paraguay. I enjoyed the beautiful blue butterflies at Iguaçu Falls, crossed the Friendship Bridge on the Paraguayan border, got my visa renewed and headed back to Salvador, Bahia. By the time I was due to travel to Paraguay for the second time, I was engaged to be married. Normally, I would not have done so, since it was against my philosophy, but since I was in a committed relationship and it seemed to be the only way to become a legal resident, I decided to tie the noose, erm, knot. Before I left, I had a divination reading done – a consultation with the cowries – and all sorts of negative portents appeared. “Work” was done to protect me and I set off on my own, this time by plane to Sao Paulo and bus from there to the triple border region where I would once again cross the bridge and briefly enter Paraguay. The first time I had done it, I had walked across, done some shopping and walked back before I realised that the most important thing was missing – a stamp in my passport! I then had to go back and sit in the Paraguay immigration office, where men in dark sunglasses scrutinised my documents, gave me the stamp – for a fee – and watched me head back across the bridge to their Brazilian counterpart, which looked for all the world like a toll booth. The first time, I had got my stamp and headed back home. This time, however, the computer said I couldn’t re-enter because I hadn’t paid the fine levied when I overstayed my visa. But I had paid it! Unfortunately, I had left the receipt behind in Salvador. For the Federal Police, the computer was never wrong, so I wandered disconsolately back to my hotel, and listened to pigeons (doves?) rustling and cooing outside my hotel window over the course of a sleepless night. Later I was told that was a blessing. Fortunately, the Federal Police officer I saw the next morning allowed me to re-enter the country officially, but just for three days! Enough time to go home, fetch the receipt and take it to the local immigration office so they could renew my visa for another three months. Three months and three days instead of six months to plan the wedding and, of course, get married! When I arrived at the Federal Police office in Salvador, receipt in hand, the officer – the same one who had had me fined and fingerprinted – was very understanding. He told me to go to the bank where I had paid the fine to get the receipt officialised. I did, but when I returned to the policeman with the proper stamps, I realised that his supposed understanding had masked utter disbelief. He clearly thought I had either bribed someone at the bank or forged the stamp, because he rushed off with the paper in hand to see for himself. Some time later, he returned and admitted that, this time, the computer really had made a mistake. I got my three months, got married, and was at least spared the need to make a third visit to Paraguay. So far so good, and I was still perfectly legal. After making every effort to play by the rules, I finished up getting the same treatment that every illegal immigrant received when they even remotely qualified for residency. That was typical of my experience in Brazil – play by the rules and rue it. I’m not advocating unlawful behaviour, certainly not malandragem, but it did make me understand why Brazilians tend to view the law as a “guideline” and invented the jeitinho brasileiro. This entry was posted in autobiography and tagged Afro-Brazilian religion, bureaucracy, expats. Bookmark the permalink.